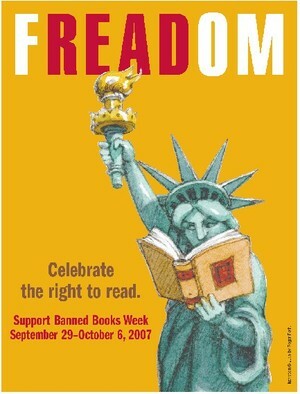 Sept 29 - Oct 6 is Banned Books Week! Humongous thanks to Random House for this awesome poster! It's Banned Books Week, and you know what that means — time to march down to the library and take out some cool, kickin', challenged or banned title, curl up in your coziest chair, say a big "thanks, clear-thinking founding people who wrote that wacky Constitution we dig so much!" for thinking up the First Amendment, and then read read read!